Detail from Noon, Natalia Korobova, 1970.
REVIEW: Ukrainian Socialist Realism: The Jurii Maniichuk and Rose Brady Collection. 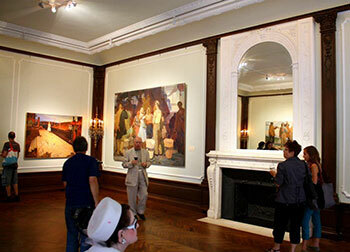 Ukrainian Institute of America, 2 E. 79th St., New York, NY– September 14-October 7, 2012. 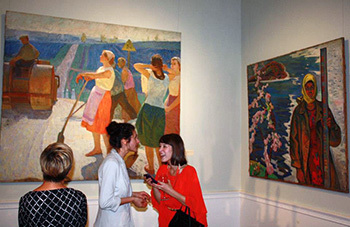 More than 300 people attended the opening of Ukrainian Socialist Realism on Sept. 14. (For a video of the opening, go to http://vimeo.com/50723536). The inaugural exhibition of more than 40 works from the Jurii Maniichuk and Rose Brady Collection marked the first time the realist and socialist paintings, which span the 1950s-1980s, have been seen by the public outside of Ukraine. Maniichuk assembled his collection, which includes over 140 paintings, while working in Kyiv in the mid-1990s. Born in 1955 in Lviv, Ukraine, he graduated with a Ph.D. from Kyiv State University and was a professor of international law before emigrating in the late 1980s. He became an American citizen in the early 1990s, returning to Kyiv as a legal consultant to the government two years after Ukraine attained its independence.. Maniichuk collected Ukrainian art at a time of great economic uncertainty, when artists were so short of resources they painted new works over old canvases. As part of the exhibition, the Ukrainian Institute of America also hosted a symposium, “Ukrainian Socialist Realism: Propaganda or Art?” More than 100 people attended the event on Sept. 16, which featured three experts on Ukrainian art: Lyudmyla Lysenko, senior lecturer in art history at the Ukrainian Academy of Art and Architecture in Kyiv; Hilary Zarycky, painter, art director, and graphic designer in New York; and Alexander Motyl, writer, painter, and professor of political science, Rutgers University-Newark. (See Motyl’s article about the exhibition and symposium: http://www.worldaffairsjournal.org/blog/alexander-j-motyl/seeing-ukrainian-socialist-realism). Ukrainian Socialist Realism was in memory of Maniichuk, who died unexpectedly while visiting Kyiv in 2009. Since his death, the collection is owned and administered by his wife, Rose Brady. Some 50 paintings from the Maniichuk-Brady collection will be on view, on a rotating basis, on the fourth floor of the Ukrainian Institute of America until 2018. For more information, contact the Ukrainian Institute of America (www.ukrainianinstitute.org). For articles about the exhibition in the Russian language, see this PDF and http://newswe.com/index.php?go=Pages&in=view&id=5268. Copyright © 2019, Rose Brady. All Rights Reserved.